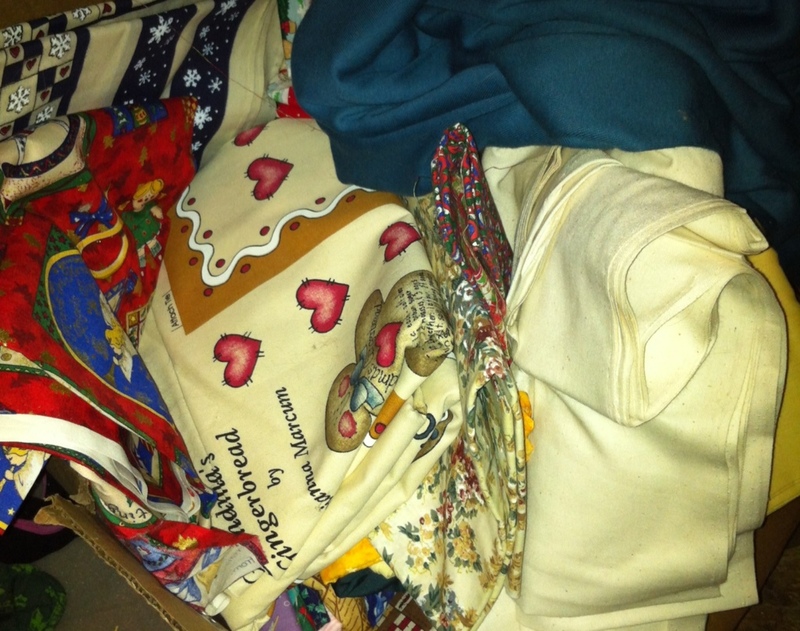 … My Crafty sister-in-law’s young co-worker gave her a bunch of fabric that had been abandoned by some relative. It, of course, found its way here. It’s mostly quilting cotton, some cuter than others. There’s a lot of Christmas fabric, which I confess doesn’t do much for me, but maybe it would be a good excuse to make a zillion reusable fabric gift bags. And there’s some really nice unbleached cotton twill. And apron prints. Lots of apron prints. >_< what would you do with a sudden and unexpected abundance of quilting cotton? Muslins? I use it for backs of donated quilts that others have pieced together and dropped off for me to quilt when they come up short. The reusable bag thing works, too, especially as teacher appreciation gifts. You could also use them to do pillowcases for those types of gifts, too. I made a bunch of simple zippered pouches for my kids’ teachers last year out of quilting cotton scraps and they went over BIG. I still have teachers thanking me this year. I would likely donate it. 🙂 If I let fabric that I don’t love stay in my stash, it becomes nothing but clutter, because I won’t ever be motivated to sew it. Someone out there will love it or need it, though! I would make (and have made) reusable gift bags. I made tons several twenty five years ago and haven’t spent a cent on Christmas wrapping paper since. I feel so green and virtuous every Christmas. AND it takes exactly 12 seconds to wrap Christmas presents. Green and lazy, the perfect combination. I forgot, I use Martha’s shoe bag instructions as a starting point. I like the drawstring technique. I second Elle C! You will be so happy with Christmas Fabric gift bags. I usually use them as contrasting fabric on shirts or inside waistbands etc (If I like the pattern). The most hideous ones are great for muslining. I get great satisfaction out of using them for this purpose and then throwing them away. I’ve also made Christmas bags, though I have a thing about wrapping presents and hate using gift bags. Maybe save what you don’t want for our meet-up! Let the girls use what you don’t want for practice fabric! I second the muslins or using it for practice fabric! Another idea is that if you have a local school with a sewing program or a community center that teaches sewing classes, try donating it there instead of Goodwill/Salvation Army. The reusable bag idea is a great idea too! One I may need to steal for this Christmas. Use the pre-printed project stuff as yardage, ignoring printed cutting lines and printed instructions. Use it for lining. Make napkins. Use to color-block/print-block a shirt or blouse. Line the cat box with it. Stuff it around drafty windows and doors. Compost it. Burn it. Make a quilt (duh). Use for muslin/toile purposes for your growing girls. Donate to a school or daycare. Make banners, streamers, rag rugs, pot holders, curtains, bedspreads. Make sheets and pillowcases. Use it for erosion control. Line your garden paths with it to discourage weeds. Use scraps for curling your hair. Braid it into jump ropes or dog leashes or a garrote to murder your enemy (don’t actually do this one). Wrap it around boxes full of other stuff to make temporary tables. Make masks for a New Year’s ball. Sell it! That stuff over here (New Zealand)is really expensive- so let it go to someone who loves it. And use the money to get fabric you like. Guilt free fabric shopping. Gotta love that. and I actually sang the song as I read your title for this post…. I need a drink! Love the title of your post! Donate the fabric that’s not inspiring you. I took on 3 pieces of someone else’s stash, then vowed never to do that again after it sat around for over a year til I finally donated it. Ehm…Christmas themed quilting cotton? Maybe the local elementary school or some children’s activity thing would like the stuff for craft projects? I wouldn’t even like using such fabric for toiles (although I would if I didn’t have anything else). The bold prints are too distracting. I agree with almost everyone else: sort it. Keep the fabrics you like and/or could use (unbleached cotton twill, depending on its weight, could be great for your period corset) and donate the rest. What you don’t want to keep you could donate to a local quilting group or guild that makes quilts to donate to charities. (LIke a children’s hospital for preemies) Local quilt shops (LQS) should be able to supply you with the name(s) of such a group. Or you could donate to Victoria Quilts. They make and give quilts to cancer patients. You can find info about them if you do an online search, but there may not be a chapter near you, but maybe a LQS can tell you if there is. Or you can have fun with it and make potholders, placemats, table runners and table cloths. Or use it to line garments, patch clothes, make bags, purses, etc, etc, etc. Last year I used Christmas print fabric to make Christmas bunting for gifts. Several of my friends have kept it up all year they liked it so much!